DU Beat brings to you the highlights from a day full of music and art at Oasis’18, BITS Pilani. Immense creativity was seen oozing at Oasis’18 as hand painted structures, instead of store-bought festoons, adorned the campus. A band of handmade life-size minions, displayed playing outside the BITS Pilani auditorium became the most popular photo booth. Other Instagram-friendly hot-spots were- an ‘Oasis’ display, letters of which were adorned with paintings of malicious women from pop culture, and a gory arrangement of Satan crying a continuous stream of blood. Overall, The artworks complimented this Oasis’ ‘evil’ theme for the year. The Stage Play competition, primarily organised by the Department of Theatre, BITS Pilani, had eight participants including the team from Shaheed Bhagat Singh College, University of Delhi. The competition was adjudged by actor and theatre artist Shilpi Marwah, a well-known name in the Delhi Theatre Circuit. Teams performed bilingual plays in Hindi and English, with limited props and a time allotment of 16 minutes. After two teams backed out from the theme-based contemporary dance competition, choreography finals were performed by the remaining six teams. Sensation from Kirori Mal College, University of Delhi, gave a sensational performance of their production, ‘The Wonder’. The participants were allotted a time limit of 10 minutes, excluding the 7 minutes allowed for the pre-performance set up. Among the other Delhi University Colleges were, College of Art, Gargi College and Lady Shri Ram College. The classical dance competition, Tandav was open for participants trained in art forms Odissi, Kathak, Kuchipudi, Bharatanatyam, Manipuri, Kathakali, Mohiniattam and Sattriya. Dancers had the entire SAC hall to present their piece. “Prepare to use all your resources and brain power to fetch the most ridiculous, unfathomable and extraordinary things possible from a list of items given to you. Each object on this list earns you specified points and the team with the highest points wins,” says the description of an event, Beg Borrow Steal, on the Oasis’18 mobile app. Organised by the Department of Informalz, the event took place in FD2 QT of the BITS premises. 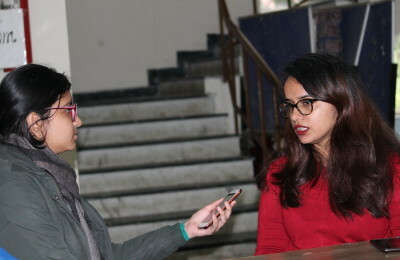 Ten teams participated in an event called Cocktail, organised by the Oasis Hindi Press in which participants gave their opinions on questions, such as whether hostels should be co-ed. Organised by the Public Policy Club, the Turncoat was adjudged by BITSian’s and club members, Mohit and Anshul, and saw more than 40 individual participations. The Tango Night saw performances by the Argentine Embassy in the open stage area of the BITS premises. Dancer Alejandra Caceres, a delegate from the Argentina Embassy, informed that their well-rehearsed piece comprised mostly impromptu steps, since they danced the way they felt at that moment. English Prof Show, the most awaited event for day one of Oasis’18 saw a large audience turn up, for renowned English virtuoso guitarist Guthrie Govan’s performance. The crowd expressed their appreciation by hooting and barricades banging. Jazzy genres and heavy metal rock instrumentals were played through tracks such as ‘Bad Asteroid’, ‘Sevens’ and ‘Furtive Jack’. Guthrie’s bandmate, 22 year old bass guitarist Mohini Dey impressed the crowd with her short solo. Drummer Gino Banks also played a drum solo that reverberated through everybody’s chests. Young music enthusiasts at the BITS Pilani auditorium were thrilled to get clicked in a group selfie with the stars, at the end of the concert.